China is a multiethnic country with a complex linguistic history. Aside from the dominant Han Chinese group, there are 55 ethnic minority groups living in China. These minorities have their own languages (an estimated 200 dialects) and writing systems. Referring to the languages spoken in the People’s Republic of China (PRC) under the umbrella term of Chinese is an over-simplification, like saying all websites are written in “programmer language.” Recent events have led some to wonder, however, if monolingualism may be an eventual goal of the PRC. Controversy over the status of the Cantonese language in Hong Kong is a symbol for its residents of impending cultural homogenization. Hong Kong was a British colony from 1842 – 1997. The United Kingdom handed Hong Kong back to China with the stipulation that Hong Kong would be allowed a high degree of autonomy in social and economic matters (but not in foreign or defense affairs) for 50 years. It was called the “one country, two systems” approach. Officially, the Hong Kong Special Administrative Region (SAR) of the People’s Republic of China is meant to operate as an autonomous territory, but political unrest has been a feature of life in Hong Kong since the handover. The Chinese government has exerted efforts to garner greater control over Hong Kong and to integrate it into the mainland, a process referred to as “Mainlandization.” This pressure has also manifested in language. Officially, Hong Kong is bi-literate and tri-lingual. This means written fluency in Chinese and English, and spoken fluency in Mandarin, Cantonese, and English. In 1997, at the time of the handover, roughly 25% of the population of Hong Kong spoke Mandarin (the other 75% spoke their mother tongue, Cantonese). Two decades later that figure is almost 50%. According to the BBC, as of 2017 there are approximately 898 million Mandarin speakers, and 73 million Cantonese speakers in the world. Right about now you may be wondering about written Chinese, and what relationship it has to Cantonese and Mandarin. 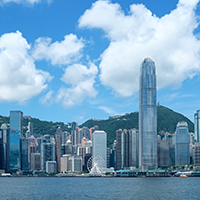 Although Cantonese is spoken in Hong Kong, the writing is the same Standard Chinese as in mainland China, with one important caveat – Hong Kong uses Traditional rather than Simplified characters. There are two standardized character sets in the contemporary Chinese written language: Simplified and Traditional. The People’s Republic of China (PRC) came to power in 1949, and most of the simplified Chinese characters used today are the result of pushes from this government throughout the 1950s and 60s. Although character simplification predates the PRC, the PRC’s initiative in the interest of increasing literacy is largely responsible for the structural simplification and reduction in the total number of standardized characters. Simplified Chinese characters are currently used in mainland China, Singapore, and Malaysia, while Traditional Chinese remains the standard in Taiwan, Hong Kong, and Macau, as well as in overseas Chinese communities, including the US and Canada. Increasingly, printed materials in the US and Canada are offered in Simplified Chinese as well, to better accommodate readers from mainland China. If you’re wondering whether to translate into Simplified or Traditional Chinese, the crucial question is where your target audience is located. Translation from Simplified Chinese into Traditional Chinese or vice versa is no simple task either. Because there is no one-to-one mapping of Simplified and Traditional characters, this cannot be an automated task. One Simplified character could convert to many Traditional characters. When Chinese writing is read aloud, it will be pronounced either in Cantonese or Mandarin – the same set of characters can be pronounced differently, because Chinese characters are ideograms and not phonograms, and so contain no information on pronunciation. Because of this, a Cantonese speaker and a Mandarin speaker reading the same set of characters will sound like they are speaking different languages. Cantonese is primarily used for spoken communication and although it can be written down, the written form is used only in informal contexts. Formal written communication in the Chinese diaspora is considered acceptable only in the Mandarin-based standard written Chinese. Before the handover to China, most local schools in Hong Kong officially taught in English, but in practice used Cantonese in the classroom. By 1999, the Education Bureau publicly stated the long-term goal of adopting Mandarin as the official language of Chinese classes, although no specific deadline was put in place. Later, the government announced plans to give $26m to up to 160 schools to make the switch. It is now estimated that about 70% of primary schools and 25% of secondary schools use only Mandarin. While the official line remains a policy of bi-literacy and trilingualism, concerned groups believe that the Education Bureau is essentially bribing schools to switch to Mandarin. Academic research has shown mixed results for the effectiveness of teaching Chinese in Mandarin, and some educators believe that the PRC has never given a satisfactory explanation of why this was adopted as a long-term goal. An advocate for Cantonese language, Societas Linguistica Hongkongensis believes the reasons for the goal are political: “to dilute Hongkongers’ attachment to their native language” and exert greater control over Hong Kong through complete integration into the Mainland before the end of the “one country, two systems” period in 2047. Professor Tse Shek-kam, Director of the Centre for Advancement of Chinese Language Education and Research at the University of Hong Kong’s Faculty of Education, points out that if speaking Mandarin really put young students at an advantage in writing Chinese, then students from Northeast China and Beijing, (where the “purest” Mandarin is spoken) should logically score highest in Chinese in public examinations. Yet, students from Shandong and Jiangsu/Zhejiang score higher. To him, there are clear advantages to teaching Chinese in Cantonese, rather than in what amounts to a foreign language to most Hong Kong students – when teachers and young students communicate in their mother tongue, the conversation is livelier, with a greater possibility for critical discussions and deeper learning. In May of this year, the issue of Cantonese vs Mandarin in Hong Kong schools gained media attention when a former official of the central government’s State Language Commission issued an article stating that Hong Kong’s official language should be Mandarin, rather than its “mother dialect,” Cantonese. This statement held a two-pronged attack: not only did Beijing seem to be making official moves to replace Cantonese with Mandarin in Hong Kong, but was also demoting Cantonese from the status of language to that of dialect. This wasn’t the first time – In 2014, the Education Bureau stated on its website that Cantonese was a “Chinese dialect that is not an official language.” After much outcry by HK residents who believe that theirs is a legitimate language and not just a dialect, the Bureau apologized and deleted the phrase. By contrast, linguists like Stephen Matthews, a linguistics professor at the University of Hong Kong, regard Cantonese and languages spoken in southern China (such as Hakka and Min) as languages in their own right, and not dialects. Since a mother tongue is defined as the first language a child hears from its mother, “it does not make sense to consider written Chinese as the mother tongue of a Cantonese speaker,” he says. While it may seem petty to argue over the definitions of terms such as “dialect” and “mother tongue,” the official status of Cantonese in the eyes of Beijing is part of what some Hong Kong locals see as a larger sublimation of their unique culture and identity. Since the handover, Mandarin is often seen as the privileged, more cosmopolitan language. Most older generations in Hong Kong speak Cantonese as their first language and have emotional ties to it, but because written Cantonese never had an official status, it can be seen as an oral language that does not help advance career prospects. Recently, a growing number of parents have taken to speaking English or Mandarin exclusively to their young children at home, in the hopes that they will pass interviews to get into sought-after international schools. This point of view dovetails nicely with the party line, which is the mellow assertion that Mandarin is proposed as a “statutory common language with which people from different places can understand each other.” A linguist on a committee advising the State Language Commission, Chao Zongqi, makes this argument, stressing that it was Hong Kong’s own business sector that organically turned to Mandarin from the necessity of communication with mainland Chinese clients. Categorizing Cantonese as a dialect and setting up a long-term plan to replace it with Mandarin in Hong Kong’s educational system is not only a matter of politics or scholasticism, but an action that has extensive social ramifications. Chinese is not a single entity. Categorizing Cantonese (along with languages like Shanghainese and Taiwanese), the mother tongue of tens of millions of people, as a dialect, is a step toward eliminating a major Sinitic language. This extinction is not inevitable, however, as other languages have been brought back from the brink. One example of this is Welsh, a language that has long been under threat, deemed “vulnerable to extinction” by UNESCO. Wales has recently launched a plan to revive the language, setting a target of one million speakers by 2050. The government has imposed compulsory Welsh lessons in schools and offered financial incentives to teachers who can teach in Welsh. According to the New York Times, language extinction is currently taking place at a rate faster than species extinction – every 14 days a language dies, or the sole speaker of a language passes away, taking with them a unique way of processing the world. Approximately 7,000 languages are currently spoken, half of which are expected to have disappeared by the end of the century. When looking for translation into written Chinese, remember to take into account the geographic location of your target audience. If you find it in mainland China, Simplified Chinese is the way to go. If your audience is based in Hong Kong or Taiwan, you need Traditional Chinese. If you’re trying to reach an audience in the US and Canada, clients are increasingly choosing to translate into both Simplified and Traditional, though Traditional is still the safest bet if you must choose one. For more information, visit: https://www.altalang.com/translation-services/simplified-chinese-translation/.